In the Irish town of Carrickwell, with its lush, endlessly rolling hills and authentic country tranquility, three women's lives are anything but calm. There's Mel, a compulsively ambitious mother/publicity manager at a high-powered PR firm -- living proof that balancing motherhood and a full-time job is no walk in the park. The hot-headed, indomitable Cleo, just out of college with a degree in hotel management, would like nothing better than to modernize and revive her family's dwindling hotel -- but faces a constant battle with her old-fashioned parents. And finally, there's the stylish, sweet-tempered Daisy, a self-consciously curvy fashion buyer for an upscale clothing boutique, who has been struggling -- and longing -- to have a baby with her absolutely perfect boyfriend. Although unconnected, these three women have one thing in common: they all need a break from their stressful lives. ...these tough gals hit the nearest spa! So each one sets out for a little R & R at the new Clouds Hill spa, built by an American woman with her own secret turmoil. It is there that Mel, Cleo, and Daisy meet -- their worlds and troubles colliding -- forming an intimate bond that helps them to realize what matters most in life, always and forever. Mel, a PR wizard who is running out of spells, battles with the guilt of being a working mother. Daisy, once an ugly duckling and now a savvy fashion buyer, wakes up to find Prince Charming has turned back into a slimy frog. And Cleo, a feisty graduate of hotel management and the little princess of her family, watches helplessly as the castle of her childhood crumbles around her. But fear not, fair ladies—a fairy godmother has arrived. Leah, a mysterious woman from America, creates a magical place in Carrickwell called Clouds Hill. Here, Mel, Daisy, and Cleo will find the answers to their problems and, along the way, rediscover the power of female friendship. A modern-day fairytale, Always and Forever doesn’t promise women the cookie-cutter, happily-ever-after ending. Instead, it casts a light on the many challenges that they face today and celebrates all the lionhearted ladies who pick up the heavy swords and slay the dragons themselves. 1. 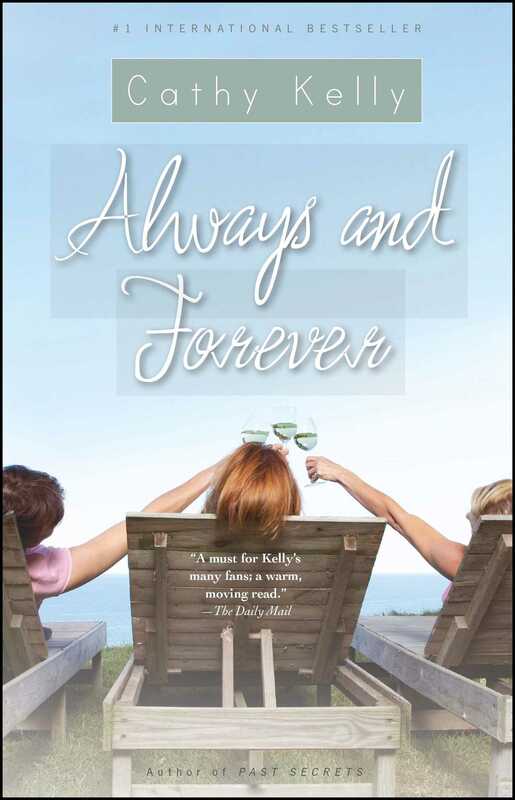 We meet four distinct women in Always and Forever. Compare and contrast Leah, Mel, Cleo, and Daisy. Which do you find the most realistic? With whom do you most identify? 2. “The longer Leah lived, the more she realized that people were blind to so many things. The secret to surviving, as she had discovered herself, was opening your eyes and seeing the world and yourself for what they both were” (page 202). What traits does Leah have that make the other women open up to her? How does she help the other characters realize their goals? 3. “I’ve spent all my working life proving that having children doesn’t mean that I’m any different to the men I work with. If you use your family as an excuse, it lets all of us down. They love to think we can’t do it as well as they can just because we have ovaries” (page 217). Do you agree or disagree with Hillary’s philosophy? How do you think the other women feel about this statement? 4. Mel, Daisy, and Cleo each have flaws that prevent them from moving forward. What are the greatest challenges they must overcome to find happiness and fulfillment? 5. Discuss each character’s journey through this novel—from her initial stasis to the event that changed everything in her world, to her quest for change and the critical choice she makes in order to defeat her obstacles. 6. “Not so long ago, she wouldn’t have dreamed of such an intimacy with someone she’d only known for a short time…. Motherhood had brought them all to the same place and gave them a bond” (page 558). Discuss the themes of motherhood and womanhood, and how they influence each character. 7. The title Always and Forever implies a story with fairytale elements. In what ways does this book resemble a traditional fairytale, and in which ways is it different? 8. The Irish Independent praised Cathy Kelly’s “capacity to write observantly and kindly about women and their relationships, lit by occasional laugh-out-loud funny interludes.” Which moments made you laugh out loud? Do you think the humor and drama are well balanced? 9. All of the novel’s protagonists are women. Overall, how do you think this book portrays men? How would the men in each character’s life describe the women? “Why do we all think we have to get married? What’s wrong with women’s brains that we feel we’re not connected with the world unless we have a man to connect us with it?” (Answer on page 107). “When I was young, I looked up to my mother and while I adored her, I didn’t want to be her. She’d given up her job when she got married and she was dependent, really dependent, on my father all her life. I didn’t want to be that person” (Answer on page 218). “It’s the laddish culture that makes women go out and get drunk” (Answer on page 252). “Irish is a lyrical and unusual language…. Simple words have many meanings” (Answer on page 344). “Groups of women are threatening, but single women aren’t” (Answer on page 506). 4. Ask the author: Send in a question to the author through her website, www.cathykelly.com/writing.htm. "A must for Kelly's many fans; a warm, moving read."